Lily Aldridge stepped out in Los Angeles on February 8th in a tribal print jumpsuit featuring red, white, black, and tan colored patterns. She topped off the look with a black designer bag and some comfy black strap sandals. I believe she met up with her husband for a meal at some point during the day, making this the perfect laid back brunch outfit. 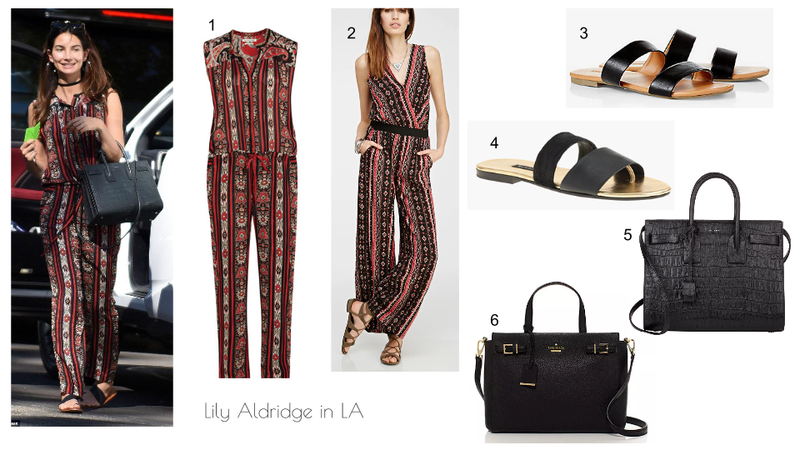 You can shop the same jumpsuit and handbag Lily is wearing below (marked with *) and find some alternatives to the other items to complete the look.